When people think of clinical trials, they often think of them as a potential treatment option of last resort for individuals who are very ill or facing a life-threatening disease, but clinical trials can offer different opportunities to many different types of individuals. For example, clinical trials can provide access to people who may not be responding well or optimally to currently available therapies, and many trials actually seek out healthy volunteers to participate in research studies. 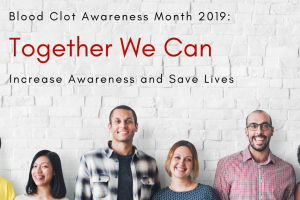 In the field of venous thromboembolism, or in clinical trials studying deep vein thrombosis (DVT) and pulmonary embolism (PE), there are literally hundreds and hundreds of studies taking place throughout the United States and around the globe. If you’re interested in participating in a clinical trial, your first step should be to learn more about clinical trials — how they are conducted, how they enroll and work with patients, and what you can expect if you find yourself part of a clinical trial. Below we address some basic questions about clinical trials, and then provide direction and resources to help you explore existing clinical trials taking place today relative to DVT and PE. Clinical trials are used in medical research to help evaluate and determine the safety and effectiveness of new drugs or new treatments, and to compare different treatments or approaches to treatment. Some clinical trials also explore the use of new diagnostic tools and medical devices, while others might look at the development or progression of disease in certain patient populations. Carefully designed clinical trials are the safest and quickest way to find treatments that work. Ideas for clinical trials usually come from researchers who first test new therapies or procedures in the laboratory and get promising results prior to planning Clinical Trials or research that will involve human subjects or patients. New therapies are tested on people only after laboratory and animal studies show that they are generally safe and may offer some promising results. 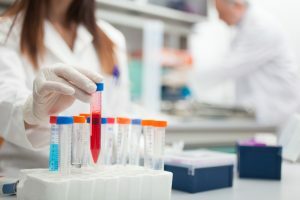 Clinical trials are sponsored or carried out by by government agencies, such as the National Institutes of Health, pharmaceutical companies, healthcare organizations, such as hospitals or health maintenance organizations, individual physicians or researchers, and companies that research and develop other medical products such as diagnostic tests, medical devices, and medical or surgical equipment. Clinical trials can take place in a number of locations, including doctors’ offices, community health centers or clinics, hospitals, and universities. More detailed information about clinical trials can be found at ClinicalTrials.Gov. 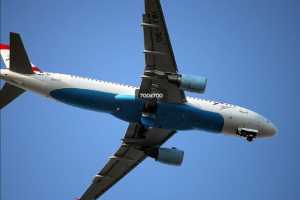 and their doses, other procedures involved in the study, and the projected timeline or schedule for all of these activities. Patients who are involved in clinical trials are usually seen fairly regularly by the research doctors or research staff to monitor their health and conduct evaluations of the effects of the medication(s) being studied in terms of safety and effectiveness. Phase I clinical trials involve just a small group of people to evaluate a new drug’s safety and to determine a safe dosage range and potential side effects. Phase II clinical trials involve a larger group of people to evaluate further if the new drug might be effective and to continue to confirm that it is safe for use in human subjects. Phase III clinical trials expand research of the new drug or therapy among a larger group of people to confirm its effectiveness, monitor side effects, compare it to commonly used treatments, and collect information that will allow the drug or treatment to be used safely. Phase IV studies, also called post-marketing surveillance studies, take place after the drug or treatment has been approved by the United States Food & Drug Administration for marketing or commercial use. Phase IV studies are very important, because they collect information about the effects of a new drug in a real world setting and in various populations and can help identify side effects associated with long-term use. All clinical trials have guidelines or criteria that identify who can and cannot participate in a research program. There are inclusion criteria that state clearly who the study subjects are intended to be, while exclusion criteria indicate who should not be included, or who should be excluded from the study. These criteria are not meant to reject people personally. Rather, the criteria are used to identify appropriate participants and to make sure that they are kept safe and also enable researchers to get the information or answers about the medication they plan to study. These guidelines may be based on an assortment of factors, including, for example: Age, type of disease, medical history, and current medical condition. Before you join a clinical trial, you must qualify for the study. Some research studies seek volunteers with illnesses or conditions to be studied in the clinical trial, while others need healthy volunteers. What guidelines are in place to protect people who participate in clinical trials from harm? There are strict government guidelines in place to ensure that people who participate in clinical trials remain safe. 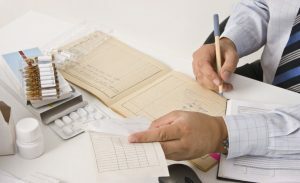 All planned clinical trials that are designed for implementation in the United States must be reviewed, approved, and monitored by an Institutional Review Board (IRB) made up of physicians, patient advocates, research and statistical experts, and other stakeholders who can help ensure that the study is ethical and that the rights and safety of the participants are protected. Federal regulations require that all institutions that conduct or support medical research involving human subjects have an IRB that initially approves and periodically reviews the research. 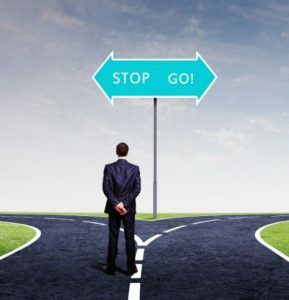 Another crucial aspect of clinical trials that helps to safeguard patients involves informed consent, or the process a patient or study subject goes through to learn about a clinical trial before they decide whether or not to participate. 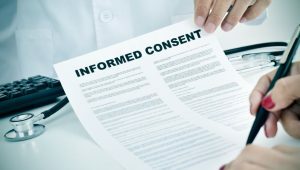 Before consenting to participate in a clinical trial, an informed consent document should explain in some detail, for example: The goals or reasons for the research, the procedures and timeline the study will employ, the potential risks study subjects may encounter in the trial, the benefits they may realize, other treatment options that might be available, and the patient’s right to leave the trial at any time. Participating in a clinical trial is a major decision, and you should ask your doctor or the research staff any questions you have before you make a decision or sign the consent form. However, it’s important to understand that informed consent is a process that continues after you sign the document of the same name. Informed consent continues throughout the duration of the study, and you should ask your doctor or the research staff questions before, during, and after the study. How do I find a study that might be of interest or benefit to me? If you are interested in participating in a clinical trial, talk to your doctor or health provider to determine if they are familiar with any trials that might be a good match for you. Your doctor also can help you determine if studies you might research on your own offer a good opportunity to you, or perhaps present an undue number of risks. There also are tools available online to facilitate your research. One of the most popular and easy-to-use tools is available at www.clinicaltrials.gov. At this site, you can access thousands of clinical trials, including many trials involving DVT/PE diagnosis, treatment, and longer-term management. 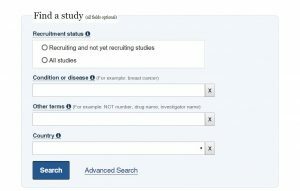 To find a specific study or to narrow your search of studies of interest to you, you can simply enter specific search terms at the top of the www.clinicaltrials.gov home page. As shown to the right, you simply enter your search terms into the data fields, then click on the “search” button. You will then be taken to a page that shows the studies that correspond with your search terms, if they exist. Instructions for Use: You can access specific instructions for how to effectively search www.clinicaltrials.gov here, and additional helpful information for patients and families can be viewed here. There are currently more than 250,000 studies based in the U.S. and other countries, listed on www.clinicaltrials.gov. The data on www.clinicaltrials.gov change daily. New studies are published on the Web site and existing studies are updated daily. To ensure that you are accessing the most up-to-date and accurate information, we encourage you to take some time to familiarize yourself with how searches are done effectively on the site, and then do your search in real time to ensure you are seeing the latest search results. As you are exploring different clinical trials, you can download and print the list of questions that appears at the link below to review your options and discuss your questions with your doctor or your clinical trials research team. Read more about clinical studies here. Learn more about other sites with information about clinical studies here. A glossary of terms related to clinical trials can be viewed here.